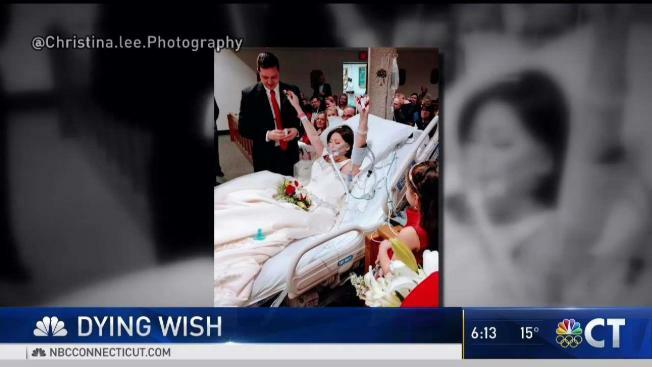 A woman gets her dying wish by getting married in the hospital. David Mosher of East Windsor, Conn., knows timing is everything; after all, he is an avid swing dancer. It was in swing dance class he met Heather Lindsay after she caught his attention from across the room. "There was one night she was wearing these killer red pants and I told the two guys sitting next to me I’m going to ask that girl out tonight," Mosher said. But, the timing just wasn’t right because Lindsay was seeing someone else. Mosher told her to let him know if anything changed. Four months later, Lindsay agreed to a date with Mosher, and over the next year and a half, the two wrote their love story. On Dec. 23, 2015, Mosher decided to propose. But before he could, Lindsay got an unexpected diagnosis. A lump in her breast that doctors had previously dismissed turned out to be much more. "[The doctor] said, 'I'm so sorry to tell you this, it's cancer,'" Mosher explained. The couple was confident it was something they would overcome, and Mosher decided to move forward with his horse-drawn carriage proposal plans. "I went down on one knee, she said 'yes'," Mosher said. Lindsay shared the day's news, both the good and the bad, with her friend Christina Karas. Over the next year, Karas helped Lindsay navigate her triple negative breast cancer diagnosis along with her hopes and her concerns. "She was so hopeful," Karas said. "The way we would talk about it, you always kind of felt this isn't it." Lindsay told Karas her biggest fear was not living to enjoy Mosher, the beautiful person who had just come into her life. When her health took a turn for the worst, her friends, family and doctors at St. Francis Hospital in Hartford knew the wedding, originally planned for Dec. 30, 2017, had to happen fast and moved up the date. "[We thought] we should just lay the dress on top of her because the energy we thought it would take to get her in would kill her," Karas said. Together, they worked to get a weak Lindsay into her gown and into the hospital’s chapel where she met Mosher to exchange vows. "She was gorgeous and she just felt like home to me," Mosher said. Barely able to speak, Lindsay murmured her vows, and just when those gathered thought she had exerted her last bit of energy, she raised her arms in celebration. The photo has been seen and shared thousands of times on social media. "That moment right there was like, 'Death, I’m not afraid of you! I am so in love and I am going to celebrate that love right now,'" she said. Eighteen hours after saying 'I do,' Lindsay died. "I saw her sick. I saw her in a lot of pain and she didn’t give up until she married me. It is so humbling that someone could love me like that," Mosher said. It was not the wedding the couple had planned, but it was one no one in the room will ever forget.